The first and only low profile, single-drum containment unit which meets EPA Container Storage Regulation 40 CFR 264.175 and Uniform Fire Code Spill Containment Regulations. Large, catastrophic leaks flow into the bladder through a bulkhead fitting. Protective "trap door" opens automatically to allow bladder to unfill. Rugged, double layer polyethylene bladder allows 66 gallons total containment. Rotationally molded (Stronger) not blow molded like Eagle's. Our deck and pallet products are stronger and will not flex and sag over time. Low 5 3/4' deck height is the same as wooden pallets - allows drums to be 'jockeyed' onto Spill Deck Systems when standard drum handling equipment is not available. Catastrophic leaks deploy the bladder, allowing the 4-drum system to meet EPA and Uniform Fire Code Spill Containment Regulations. 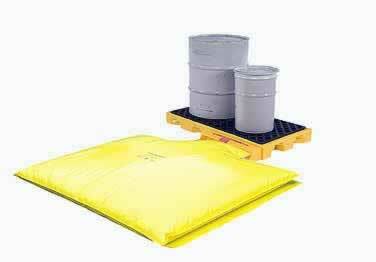 meets EPA Container Storage Regulation 40 CFR 264.175 and Uniform Fire Code Spill Containment Regulations.